The Tibetan Terrier is an old breed developed from ancient breeds called the North KunLun Mountain Dog and the Inner Mongolian Dog, which resembled a Poodle. The Tibetan Terrier hails from Tibet and was instrumental in the development of all other Tibetan breeds, including the Lhasa Apso, the Shih-Tzu, and the Tibetan Spaniel. 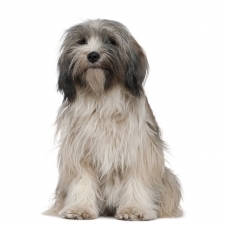 Despite their name, the Tibetan Terrier is not a terrier but a true herding dog. They were raised by Buddhist monks, known as lamas, and were prized as companions and also as sheep herders. In fact, they were known to jump on the backs of the sheep while bringing them to and from the mountains. These little dogs were highly prized as good luck bringers. The Tibetan Terrier was never sold, but were often given as gifts. In the 1920s, Dr. Greig of England was working for the Women’s Medical Service of India and was rewarded with one of these shaggy dogs for saving a Tibetan citizen’s life. She was also given the other dog from the Dalai Lama himself. Even though she was unsuccessful in breeding these dogs, she did introduce the breed to the Western world. The Tibetan Terrier is a happy, loving, and devoted family dog. They are smart, pleasant, and affectionate. They are known to be very sensitive to the moods of the people around them, and are dedicated to their families and do well with children. The Tibetan Terrier needs minimal exercise, but they love to play and go for long walks; however, at the end of the day they can be calm and laid back and enjoy down time with their family. They are very intelligent, but they still need a firm hand or they will take over your house. They make excellent watchdogs by alerting you with a loud bark. These dogs don’t like to be left alone for long periods, preferring the company of the people they love. The Tibetan Terrier usually weighs between 18 to 30 pounds and stands approximately 14 to 16 inches tall. Their coat is long and shaggy and covers their face. Colors range from white, gray, black, golden, with or without white or tan. This breed was originally called Lhasa Terriers. In 1930 the Indian Kennel Club changed the name of the breed to Tibetan Terriers. They were imported to the United States in 1956 by Dr. Henry and Mrs. Alice Murphy of Great Falls, Virginia.